Information about these mines is scarce as not very many were made, in fact it is possible that the glass portion of this unit is reproduction, however the fuze and plate are genuine probably the only surviving parts of the original. Being made of glass and used as an anti personal device it would be difficult to detect by normal mine detection equipment, it worked by breaking the glass cover when trod upon. Inside this unit is a dummy charge made to look like the original explosive. The Round Coloured glass disc sat on top of the thin sheet of glass over the trip to weigh it down. Known as the Glasmine43. The glass mine was original made for costal defence and wet areas, Glass being the ultimate in waterproofing, the top sealed with a bitumen paste. 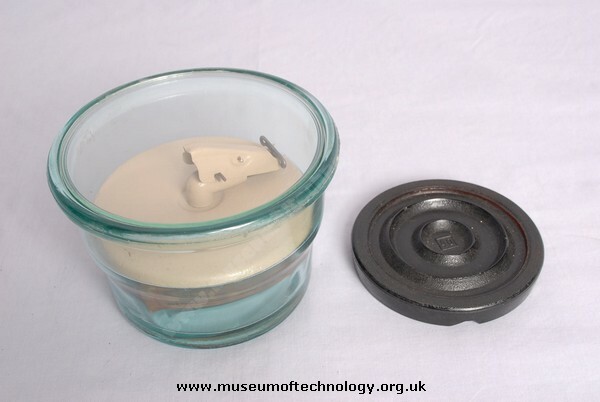 As for detecting the glass mine can be picked up by a conventional detector of the time as it has a large metal disc inside that holds the fuze that sits inside on a formed rim which is part of the glass body. There was a plate made of glass and a chemical fuze (used in the Topf mine) completely made of glass as well that made the mine undetectable. The reference to radioactive sand used by the Germans in mine warfare was used with the Topf mine that was made completely out of tarred chipboard or plywood with glass plugs and fuze holder and cardboard carrying handle. Each Topf mine came with a bag of radioactive sand. With the mine followed a small pouch of "camouflage earth", which was ordered to be located on the mine, when the mine was laid. The "earth" was radioactive, so Germans could find their own mines, if necessary, using radiometer. Of course the real purpose of the "earth" was kept secret. The Glass mine was designed to maim and not kill. The idea was to blow off toes or a foot there by causing two additional soldiers to be removed from combat carrying their wounded comrade off the battlefield. Allied advances in electronic mine detection were based on mines being made of metal. By making them of glass or wood like the German schuh mine, the clearing of a minefield once again became slow and hazardous. A simple innovation to defeat an electronic countermeasure. The glass fragments where intended to cause fatal injury to the soldier who befell them. Glass fragments could not be found through traditional x-ray detection, (as the case when locating shrapnel from an injury as a result of an exploding metal mine), furthermore, insidious glass fragments lodged in the flesh would increase the extent of the injury, allowing further infection to spread more rapidly. One aspect behind the glass mine production opposed to a metal mine, whereas necessity for wartime production resources allocated metal for more important uses, therefore glass was a more practical solution for any factory producing anti-personnel explosive mines during 1943 (hence, glass mine 43).